Celebrate Father’s Day with a Sunday Jazz concert! The Peter Mazza Quartet will be performing Sunday, June 17, 2018 from 5 PM to 7 PM at The Ben Tucker Pavillion, 2 Resort Dr. Savannah, GA, 31412. Coastal Jazz Association Members attend for free! Non-members can purchase tickets at www.eventbrite.com/e/the-peter mazza- quartet- tickets 44202083622? 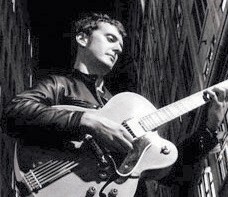 Peter Mazza is a remarkably accomplished jazz guitarist and composer from New York City. Peter is recognized for his passionate and poignant interpretations of the most complex jazz standards. Blending clean and fluent lines with colorful and inventive chord voicings, he creates lush solo guitar pieces as well as imaginative ensemble arrangements. Born and raised in New York City, he was encouraged to pursue his interest in music by his father, an accomplished jazz pianist. Having graduated from the distinguished Manhattan School of Music, he has been playing and teaching for more than 10 years. Peter went on to gain acceptance from the prestigious Thelonius Monk Jazz Guitar Competition when he was ranked semifinalist by a panel of renowned guitarists.